"This star was already completely unique because of its sporadic dimming episodes. But now we see that it has other features that are just as strange, both slowly dimming for almost three years and then suddenly getting fainter much more rapidly," said Josh Simon of the Carnegie Institute for Science. The star known by the unassuming name of KIC 8462852 in the constellation Cygnus has been raising eyebrows both in and outside of the scientific community for the past year. In 2015 a team of astronomers announced that the star underwent a series of very brief, non-periodic dimming events while it was being monitored by NASA's Kepler space telescope, and no one could quite figure out what caused them. A new study from Carnegie's Josh Simon and Caltech's Ben Montet has deepened the mystery. Simon and Montet's findings caused a stir in August, when they were posted on a preprint server while their paper was being reviewed. Now their work is now accepted for publication by The Astrophysical Journal. 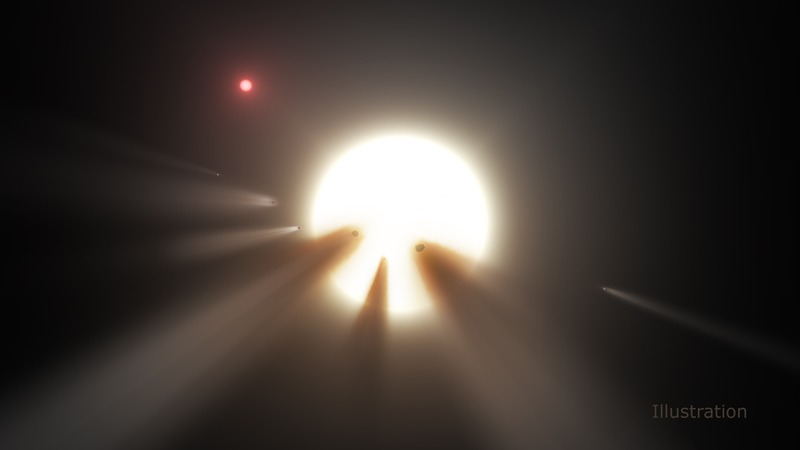 Speculation to explain KIC 8462852's dips in brightness has ranged from an unusually large group of comets orbiting the star to an alien megastructure. In general, stars can appear to dim because a solid object like a planet or a cloud of dust and gas passes between it and the observer, eclipsing and effectively dimming its brightness for a time. But the erratic pattern of abrupt fading and re-brightening in KIC 8462852 is unlike that seen for any other star. Spurred by a controversial claim that the star's brightness gradually decreased by 14 percent from 1890 to 1989, Montet and Simon decided to investigate its behavior in a series of Kepler calibration images that had not previously been used for scientific measurements. "We thought that these data could confirm or refute the star's long-term fading, and hopefully clarify what was causing the extraordinary dimming events observed in KIC 8462852," explained Simon. Astronomers were already running short of good ideas to account for the dips in KIC 8462852's brightness, and the new results will make that task even harder. Simon and Montet think that the best proposal so far for explaining the star's drastic six month dimming might be a collision or breakup of a planet or comet in the star's system, creating a short-term cloud of dust and debris that blocks some starlight. However, this wouldn't explain the longer-term dimming observed during the first three years of Kepler and suggested by measurements of the star dating back to the nineteenth century. "It's a big challenge to come up with a good explanation for a star doing three different things that have never been seen before," Montet said. "But these observations will provide an important clue to solving the mystery of KIC 8462852."